September is here again. Every year I feel so sad to say goodbye to summer, but I forget how gorgeous Autumn is. The air smells cold and my fingers are chilled, but it reminds me of playing marbles in the playground when I was a kid. I started running just over 2 years ago and it was about this time of year that I did my first parkrun. It was so nice not to have to run on my own and I went nearly every week over that winter. I think maybe it is because of those cold parkruns that I associate running with the smell of frost and the feeling of cold in my fingers and puffs of breath in the air. Parkrun was my first taste of the competitive but friendly world of running. I also learned the most important running lesson. Don’t assume. Don’t assume the old chap is going to be slow. Don’t assume the skinny racing snake is going to be quick. 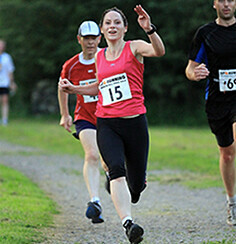 And definitely don’t assume that the curvy girl isn’t quick and would hesitate to flatten you on her sprint finish. People assumed I was quick as I was slim and dressed in a vest. Nope. Just slim and too tight to fork out for a proper warm running top. My first parkrun time was 29:31. I was thrilled to have a 'proper' time but at the same time a little bit disappointed that it wasn’t as quick as I’d run it on the treadmill at the gym. Welcome to hills and broken paths and starting out too fast in a race, New Runner.